Bitcoin is a virtual currency. This means that it only exists digitally, it does not have physical notes or coins, and it can be used to buy things on the internet. One of the major reasons that people might want to use Bitcoin is that it exists internationally and isn’t controlled by any one government or company. This can be very useful as lots of businesses now operate online, and trade in multiple countries. Companies and individuals want to avoid paying transaction fees and taxes when they swap between currencies. With a digital currency like Bitcoin they don’t need to pay any of these charges. One big drawback to Bitcoin is that currently there aren’t many retailers which will accept it as a currency, although the Isle of Man has recently welcomed a growing number of businesses which accept Bitcoins. Another drawback is that digital currencies are a new technology, and as a result the price of Bitcoins fluctuates dramatically. There could also be other difficulties such as hackers stealing Bitcoins. All of these problems have been encountered recently, so before you rush to invest your savings in Bitcoin you need to be wary of the pitfalls! In order to work Bitcoin needs to overcome several major hurdles. Firstly it must make sure that transactions involving Bitcoins are secure. Bitcoin does this using something called ‘elliptic curve cryptography’ to ensure the security of transactions between owners of Bitcoins. Elliptic curve cryptography is a type of public key cryptography, relying on mathematics to ensure that a transaction can be secure. Read more about elliptic curve cryptography. Another problem is the potential duplication of Bitcoins. Imagine if you invented a digital currency yourself called the green blob currency and sent your friend 10 digital green blobs. You would have a big problem – your friend could simply cut and paste your green blobs and send everyone in your school 10 green blobs each. You couldn’t stop the currency being duplicated and it would become worthless. This is a fundamental problem which needs to be solved before you can create a virtual digital currency. Bitcoin gets around this problem by using something called a “blockchain”. This is a register of all transactions to date, which everyone can see. The blockchain shows when Bitcoins are created, and when they pass between individuals. Bitcoin have a very clever way of making sure that the blockchain is accurate. If it was possible to falsify the blockchain it would be possible to steal or duplicate the currency and Bitcoin again wouldn’t work, as it needs an accurate register of all transactions to work. The blockchain is checked for accuracy by computers that solve huge number crunching problems. Bitcoin relies on thousands of computers across the world solving complicated problems which verify the transactions and prove that the blockchain is accurate. Computing power doesn’t come for free. 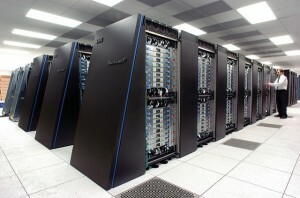 The calculations involved require very powerful computers which cost a lot of money, and they also require storage space and electricity to operate. Bitcoin needs to provide an incentive for people to solve these number crunching problems and it does this by rewarding people with new Bitcoins when they solve a problem. This is the only way that new Bitcoins are created. Doing the number crunching which verifies a blockchain is called ‘mining’ Bitcoins. The computing power needed to mine Bitcoins is now so big that individual people don’t typically take part, unless they pool their resources. What decides the price of a Bitcoin? On any one day you can look up what a Bitcoin is worth in British pounds or US Dollars. The value of a Bitcoin is simply determined by the laws of supply and demand – there are a limited number of Bitcoins in circulation, and therefore their price is decided by how popular they are, and how many people want to trade in Bitcoins at that time. The chart below shows how the price of Bitcoins changed over a two year period. The price varied so much that it will certainly make a lot of investors wary about losing their money! One really interesting thing to note about Bitcoins is that they are designed so that over time fewer new coins will be mined. Around the year 2140 there will be no more new Bitcoins created. From an economics point of view this creates some very interesting questions about what will happen to the value of Bitcoins in the future. Bitcoin can only function because of the clever mathematics which is in the background enabling it to exist. In fact Bitcoin is often called a ‘cryptocurrency’ because its existence relies on cryptography – the branch of mathematics related to keeping information secret. Since its creation in 2009 Bitcoin has created intense media coverage and speculation as to what will happen with this new currency. Will Bitcoin be the currency of the future, will it make people rich, or collapse overnight? Or will Bitcoin remain as a currency which only a minority of people are willing to invest and trade with? Watch this space! While only a tiny minority of people actually make their living from Bitcoin at the moment, there are lots of technical jobs available which will use similar skills. If you are fascinated by how virtual currencies work then you might be interested in a career as an economist, where you can examine the role of economic factors such as supply and demand as part of your work. If you want to study economics at university you will need to study A-level Mathematics. You might also like to consider studying Further Mathematics A-level. Equally you might be interested in the high end computing which is behind Bitcoin, or finding out more about the complex mathematics involved. In this case a degree in computer science or mathematics could be a great starting point for a career in a highly technical industry, which could be in computer programming, cryptography or other areas. One great thing about studying a mathematical subject is that there will be lots of different areas open to you when you graduate.